Set your own pace with Sixt car rental in Zakynthos. This beautiful Greek island is a joy to explore and with branches in key locations such as Zakynthos Port and Zakynthos Airport, you are never far from the right rental vehicle. Our fleet of affordable economy vehicles and luxury rental cars from leading brands like Mercedes Benz, Audi, and BMW enables you to easily rent a car in Zakynthos that fits your budget and mobility needs. And, with 24 hour return bookable at either site, you don't have to worry about details like departure times. Browse the page for information on car rental in Zakynthos or take a look at our drop down menu if you require pertinent details like directions to our branches or exact opening times. Choose your rental vehicle from our large fleet of sports cars and convertibles, roomy SUVs and compact city cars and then simply reserve the one that's right for you online. Please note that while we always supply the selected vehicle category we can't promise specific models as they are subject to availability. Car rental in Zakynthos allows you to enjoy the beaches and spectacular scenery in comfort and style. Maybe you have always wanted to drive along the shores of the Ionian Sea in a sleek convertible but felt that it was beyond your budget. If you do a quick price comparison check, you may be surprised at just how affordable our rental cars are. If you are visiting with family or friends, you might like the extra space for passengers and luggage that an SUV offers. Or, if you are coming to Zakynthos on business, a sophisticated sedan might suit your requirements. Those arriving on the island by air can pick up their vehicle at our Zakynthos Airport (ZTH) car rental location. Also know as Dionysios Solomos, the airport is near the town of Kalamaki and the 3.3 mile drive to the center of Zakynthos takes just 12 minutes. 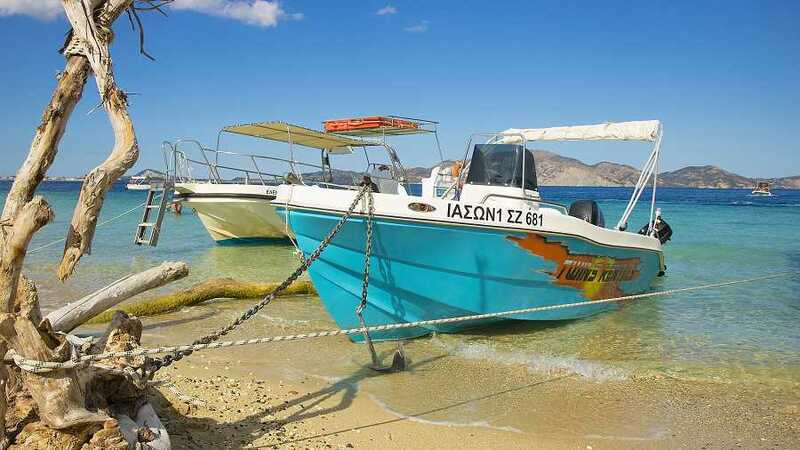 Alternatively, pick up your vehicle at Zakynthos Port an easy to reach location from the town center and an ideal starting point if you want to explore the island's rugged northern coast. When you rent a car in Zakynthos you won't have to rely on local bus services which tend to be infrequent. There are only a few roads on the island so everywhere is relatively easy to reach. Kakynthos Town is the island's largest town and the piazza and port are among its most popular places. The town lost many of its Venetian ruins during an earthquake but many have been beautifully restored and the piazza is said to look almost exactly like St. Mark's Square in Venice. You'll also find some of the best shops here so be sure to stock up on local crafts and leather goods. Zakynthos Town is an excellent base from which to explore local sights like the Blue Caves near Cape Skinari or the beach and marine reserve at Dafni. 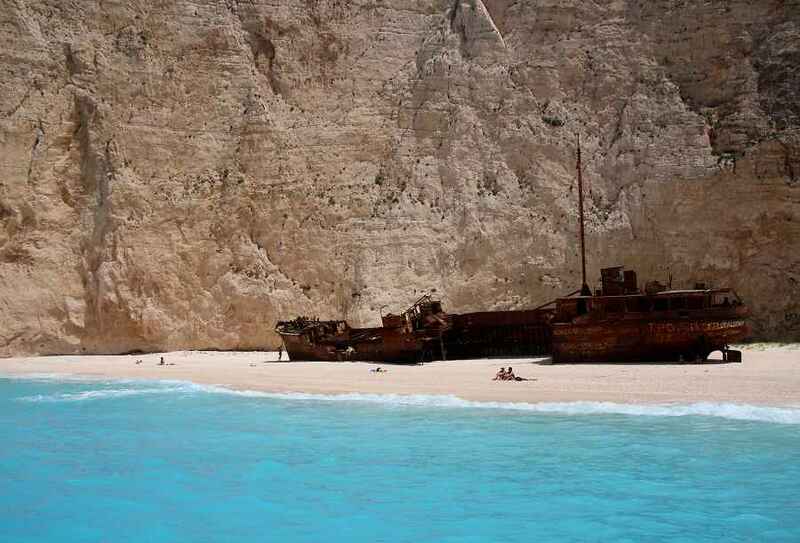 No vacation or trip to Zakynthos is complete unless you have seen Shipwreck Cove. The beautiful sheltered cove at Navagio is one of the island's most popular landmarks. Try to arrive early as the beach and the wreck itself can get busy. Fans of extreme sports can try base jumping from the surrounding cliffs. Head for Vasilikos and Agios Nikolaos beach. Agios Nikolaos is considered the island's best beach and is ideal for water sports enthusiasts as well as sun worshipers. Try a jet ski, swim or dive in the clear blue waters or simply relax on the sand with a cool drink.